Cows are considered sacred by a large number of Indians. They are a popular theme in sculptures and a source of meat in other parts of the world. In this post I am bringing together some of my favourite images of cows and cow-sculptures from different corners of the world. Let me start this post with a beautiful green cow with black dots from the 2015 World Expo in Milan. The popularity of cow-sculptures can be understood from the "Cows in Parade" initiative - it was one of the biggest public art events ever organised and between 1999 till 2015, has been held in about 15 countries so far. In this post, I am devoting more space to cows in India because it is here that we have such a complex relationship with them and because they evoke so much passions among Indians unlike any other animal. As in almost every aspect of life, India has multiple and contradictory approaches to the cows and their sacredness. On one hand, people offer food and prayers to them, build Gaushalas (cow homes) for them, and put up their statues in the temples. The beliefs about the sacredness of cows, though more predominant among Hindus, are shared in different degrees between the different Indic religions. On other other hand, ill nourished cows can be seen looking for food in the garbage dumps, eating plastic bags and sitting abandoned in the middle of the roads while the traffic passes around them. My images of cows from India bring together some of these contradictions. Let me start with some images from the north-east of India. The first image is from Ambubashi festival in Guwahati. One of the Sadhavis near the Kamakhaya temple asked me to click her picture with the Gaumata (mother cow). The next two beautiful images of the cow sculptures are from the entrance of the Shukreshwar temple on the banks of Brahmaputra in Guwahati. These include a statue of the mythical Kamdhenu cow. The fourth image is about the worship of a young cow during the Rongali Bihu celebration in Assam. The fifth image is from Bellary district in Karnataka, showing a cattle market, especially for the sale of cows. The next image is also from north Karnataka, showing a centre for protection of indigenous varieties of Indian cows. It includes services for sterilizing and making medicines from the cow urine according to the Ayurveda traditions. The next Indian image is actually from the V.A. museum in London, showing an antique sculpture of the mythical Kamdhenu from south India. Kamdhenu is the cow of the gods, which can fulfill all the wishes of those who pray to it. The next image is from a Garbage dump in Boragaon (Assam) showing cows searching for food. The final image from India is from Nagaland, showing the cow/bull horns decorating the entrance of a house. Different parts of India, especially in the north-east and in Kerala, also have wide-spread traditions of eating cow meat. While in India the cow sculptures are almost always linked with Hindu temples, in the rest of the world, cows do not have a sacred significance. Instead, as mentioned earlier about the "Cow in Parade" initiative, cow sculptures are mainly about art. Let me start this part with a cow sculpture from Brazil, which has a huge cow meat-eating culture. This beautiful sculpture is from Goiania in central part of the country. 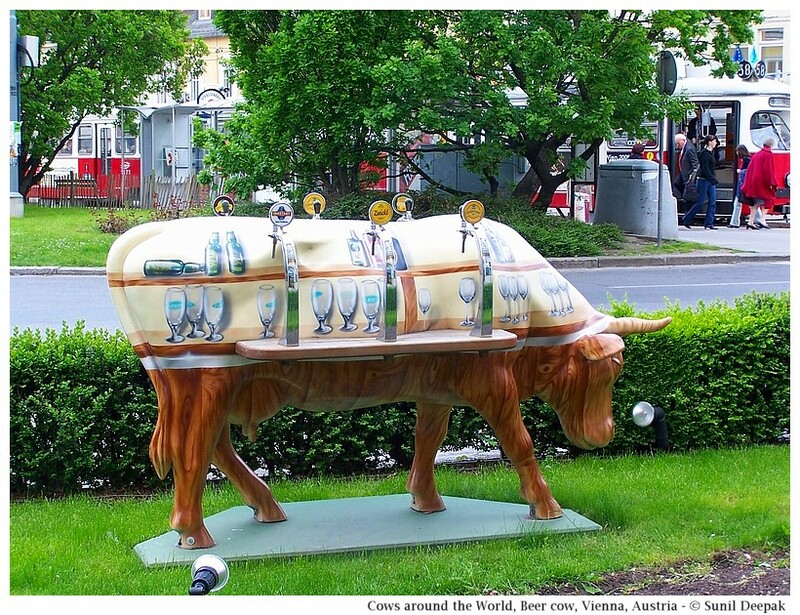 The next cow sculpture is from Vienna in Austria. It is designed like a bar for drinking beer. The next two images of multi-coloured cows were clicked in the World Expo 2015 in Milan (Italy), but they are a part of the "Cows in Parade" initiative. The final two images of cows are from the Novegno mountain near our home in Schio in north-east of Italy, showing two varieties of local cows placidly grazing in the green mountain pastures. Under the pressure of globalisation, specific high milk-yielding species of cows are replacing the indigenous species of cows all around the world. In this scenario, some groups are fighting to conserve their indigenous varieties of cows. I hope you have enjoyed this world tour of the cows and cow-sculptures. These were not exactly 80 cows (there are around 40-45 cows in these images) but I liked the title so much that I had to use it. When I thought of writing this post, I did not realise that I had so many pictures of cows from different parts of the world. In the end, I had to leave out many of those images, but I had fun selecting the images and writing it! Let me conclude this post with an image of blue cow sculpture with the European flag from the World Expo in Milan. Nice to know about the varieties of cows. Enjoyed the pictures. Have a great 2018. Thanks Laxmi Gupta for your appreciation. Best wishes for a great 2018 to you as well.